Please note that times are approximate. Students are expected to be at the designated bus stop 10 minutes prior to the stop time. If your address cannot be found, please call 502-695-6707. 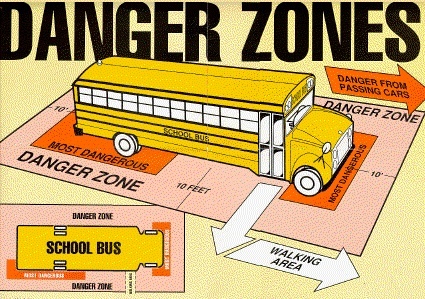 All areas close to the bus are Danger Zones. Students should NEVER go into these zones except when loading and unloading. Students should wait at least 10 feet from the curb and not approach the bus until it comes to a complete stop and the door is opened. Students should arrive at their bus stop at least five (5) minutes before the bus is scheduled to arrive. There should be NO horseplay, pushing, shoving or running when the bus is arriving, waiting or leaving. Students should NEVER pick up anything dropped near the wheels, under the bus or in front of the bus. If something is dropped, the driver should be told and the student will be given instructions on what to do. Students should NEVER run after the bus and NEVER bang on the side of the bus. Students must walk 10 feet straight away from the bus when they exit, and then turn in the direction they wish to go. Students who cross the street must walk 10 steps ahead of the bus before turning to cross. The student is not to cross the street until the driver gives them an “OKAY” signal that it is safe to cross. Students should still look left and right before crossing. Parents should look for and remove strings hanging off of students’ jackets and backpacks. When on the bus, students should remain seated, face forward and talk softly. There is to be no eating, drinking, dipping or smoking on the bus. E-cigarettes are not to be used. The bus driver is in charge at all times and will assign seats. As a reminder to those that drive the roads of Franklin County, when you see a school bus you must assume a student is near and take extra caution.